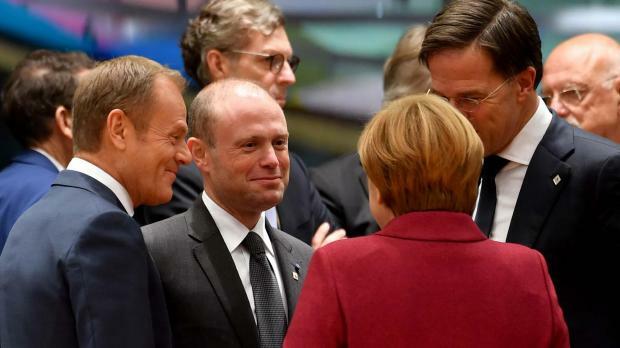 There was “tension” all around when discussing the cohesion fund within the European Union’s budget, Prime Minister Joseph Muscat admitted on Thursday. Dr Muscat however said he was "very optimistic" that a solution acceptable to all parties would be found in the months ahead. "It looks like the Commission is coming round to realising how important these funds are," he told the Times of Malta in Brussels. "A group of 16 countries is arguing this way, and the gap between what was first proposed and now has been reduced substantially. We're not there yet but I'm very optimistic," he said. EU leaders held further talks on cohesion fund negotiations on Friday but were tight-lipped about any further progress, saying only that they hoped to sew up negotiations by autumn 2019. The Times of Malta reported in May Malta was set to be among the EU’s biggest cohesion fund losers under budget plans unveiled by the European Commission. Those initial proposals would have seen cohesion funds cut across the board for all recipient member states, with Malta having to make do with 24 per cent fewer funds - a drop of €179 million - for the 2021 to 2027 period. EU cohesion funds, which are intended to help less developed member states catch up with the union's wealthier nations, face dramatic cuts as the EU sets its next six-year budget. The cuts - in part due to the EU departure of Britain, a net contributor to EU coffers, and partly a byproduct of relatively slow pace of economic growth across the EU as a whole - are likely to impact all member states which joined the union back in the 2004 accession process. Malta's rapid GDP growth also risks derailing local hopes of a healthy cohesion fund package, with the European Commission using GDP per capita as the key factor in determining the allocation of cohesion funds. ""There is less money for more priorities," Dr Muscat admitted.